The ABB Terra 53 fast charging station supports three of the four electric car fast charging standards, making it capable of bringing harmony to a fractured market for fast charging. 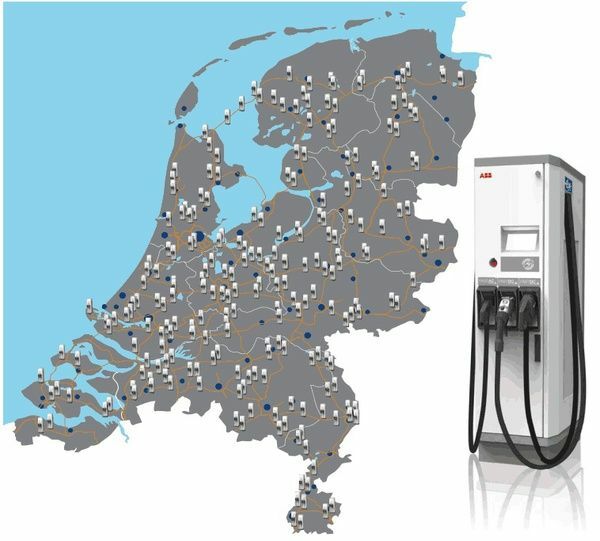 In today's electric vehicle market, several European countries are setting up nation-wide electric vehicle charging networks. The infrastructure choices are made more complicated because the electric car makers haven't made fast charging systems that are compatible across vendors. Enter electrical systems giant ABB and the Terra 53 multi-protocol charging station, that just received the CE certification that will allow ABB to begin selling equipment at the scale necessary for large-scale charging networks covering whole countries. On Tuesday, ABB announced they'd achieved CE certification for the 50 kilowatt Terra 53 Combo Charging System compatible fast charging station. This certification is required to sell units in Europe. ABB's charging stations are being deployed in national-scale charging networks in at least Estonia, Denmark, Northern Ireland, and The Netherlands. “To support the rollout of nationwide charging networks in Estonia, Denmark, Northern Ireland, The Netherlands and more to come, we’ve been relentlessly focused on adhering to industry-leading public standards of connectivity, quality and reliability. CE certification by an independent certification body is a clear recognition of our commitment to these principles and demonstrates the robustness and high level of safety of our new and already installed public and private charging stations” said Hans Streng, Senior Vice President and General Manager of ABB’s EV Charging Infrastructure Product Group. Today, it isn't just a matter of installing fast charging stations. Some electric cars use the CHAdeMO fast charging standard, others use the SAE DC Fast Charging standard (a.k.a. Combo Charging System, or CCS), while even others use three phase AC (AC Type 2, Mode 3). That means an electric car owner could find themselves at an incompatible charging station and unable to recharge their car. However the ABB Terra 53, by supporting all three of these standards, gets around that problem. The electric car driver simply plugs in the charging cord that's compatible with their car. In each of these cases typical electric cars can snag an 80% recharge, for 60-70 miles of range, in a half hour or so. This makes electric cars more flexible than if the recharge required 3-4 hours to finish. ABB recently participated in BMW and Volkswagen’s Interoperabilty workshops with the Terra 53 and demonstrated successful charging of the next generation of CCS compatible EV’s. Most recently, BMW used ABB’s Terra 53 at the IAA Live-Drive event in Frankfurt to charge the BMWi3. The Chevy Spark EV and the BMW i3 are the first CCS-compatible electric cars on the market, and more are expected over the coming years. The Renault ZOE and the 3rd generation smart ForTwo Electric Drive both support the 3 phase AC fast charging system. Over the course of the next few years it's expected the balance of fast charging standards to shift from the CHAdeMO system that primarily supports the Nissan Leaf, over to the CCS or three phase AC systems. The Tesla Supercharger system is incompatible with all three of those systems, meaning Tesla electric car owners either will charge at a Supercharger system or else require an adapter to use a CHAdeMO or CCS fast charging station. Tesla has committed to developing a CHAdeMO adapter.